African American older adults have among the highest rates of diabetes and diabetes-related complications compared to most racial/ethnic subgroups in the United States (Office of Minority Health, 2016). Complications occur because of inadequate day-to-day self-management of the condition. Standard self-management behaviors include tasks such as regular blood glucose monitoring, eating a healthy diet, and taking medications (American Association of Diabetes Educators, 2018). Diabetes knowledge has been associated with improved diabetes outcomes and fewer complications (Chrvala, Sherr, & Lipman, 2016; Gosse, 2014). Previous studies have reported low diabetes knowledge among African American older adults and have linked this phenomenon to high rates of complications (Moussa, Sherrod, & Choi, 2013; Schoenberg, Amey, & Coward, 1998). Diabetes knowledge is conceptualized according to how clinicians approach the condition, and measures of diabetes knowledge have a distinct biomedical orientation (Dunn et al., 1984; Fitzgerald et al., 1998; Fitzgerald et al., 2016; Keyserling et al., 2002; Quandt et al., 2014). Hence, the focus is on formal knowledge of glycemic control, signs and symptoms of abnormal blood glucose and diabetes complications, foot care, and using diet and physical activity to control blood sugar and reduce cardiovascular complications. However, there is a social component to health knowledge that is overlooked (Bandura, 2004). Many patients understand diabetes within the context of the experiences of their family members, friends, or others (Quandt et al., 2013). This informal knowledge, which is derived outside of the clinical setting, is not easily assessed by current diabetes knowledge metrics. Assessing diabetes knowledge from a biomedical perspective is important; however, assessing diabetes knowledge without considering patients' informal knowledge may lead to missed opportunities for clinicians to provide appropriate diabetes education that addresses patients' experiential understanding of the condition. This distinction between formal and informal knowledge is particularly meaningful for cultural groups such as African American individuals who have relied on the experiential and intergenerational transfer of knowledge to maintain their health and well-being due to barriers related to health care access and the receipt of inferior health care (Mitchem, 2007). More work is needed to understand how clinicians might assess and leverage patients' informal, experiential diabetes knowledge. The current article provides examples of informal knowledge that African American older adults associated with their experiences with diabetes and suggests ways that clinicians might engage patients beyond the biomedical approach. The current study was approved by the University of California, Los Angeles Institutional Review Board (IRB). The sample was recruited from an agency that serves older adults in South Los Angeles. This metropolitan area has the highest concentration of African American individuals and the highest rates of diabetes in Los Angeles County. An IRB–approved flyer was used to invite potential participants to learn about the study. Staff from the agency posted copies of the flyer in each research site and distributed flyers to older adults whom staff knew had diabetes. The principal investigator (PI; K.S.J.) distributed flyers to older adults who were enrolled in the agency's diabetes self-management classes and those who attended health fairs hosted by the agency. Approximately 300 older adults were given flyers. Despite the personal outreach conducted by the staff and PI, a small proportion of older adults inquired about or attended information meetings about the study. Thirty-six potential participants were screened for eligibility. Community-dwelling individuals ages 55 and older, who had a hemoglobin A1c (A1c) of ≥8% and were able to care for themselves independently were eligible. An A1c of 8% was used to indicate uncontrolled diabetes instead of the standard ≥7% to reflect less stringent clinical thresholds for older adults (Kirkman et al., 2012). Individuals were ineligible if they reported having a terminal health condition, cognitive impairment, or were unable to verbalize their understanding of the study. Twenty-one individuals were excluded because their A1c levels were <8%. The first author (K.S.J. ), a RN, obtained participants' A1c levels using the PTS Diagnostics A1C Now+® point-of-care system (Moskowitz et al., 2018). Each eligible participant gave his/her signed consent before enrolling. The purpose of the study was to describe the meanings that participants gave to their social experiences throughout their life courses and their diabetes experiences in older age. A qualitative approach was used, including initial and focused coding (i.e., labeling and organizing related data into categories), memoing (i.e., reflecting on the data and exploring hunches about developing themes), and constant comparison analysis (i.e., comparing and contrasting participant narratives and categories to identify properties and dimensions) (Charmaz, 2014). Major themes were derived from codes/categories that were similar or overlapped. Sub-themes were identified when old and new codes were compared throughout the analysis. Sub-themes were decided upon if they provided nuanced representations of the major themes. Data were collected through semi-structured focus groups composed of two to five participants and semi-structured individual interviews that occurred 1 to 2 weeks later. Focus groups provided the advantage of interpersonal conversation to facilitate recall of social experiences that occurred throughout participants' life courses. Individual interviews provided privacy for participants to share their personal experiences with uncontrolled diabetes. All interviews were led by the first author, lasted approximately 1 hour, and were audio recorded and transcribed verbatim. The interviewer began each focus group and individual interview by describing their distinct purposes—to discuss participants' life course experiences in the focus groups and diabetes experiences in their individual interviews. Data about participants' diabetes experiences are presented. 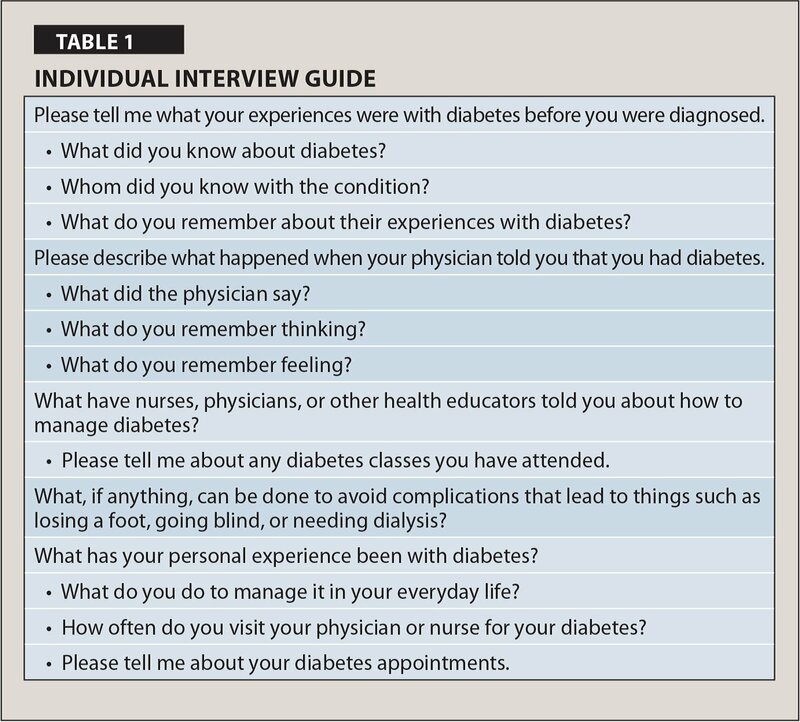 The semi-structured individual interview guide used to elicit participants' diabetes experiences is shown in Table 1. Participants received a gift bag of diabetes product samples and diabetes educational materials, valued at approximately $15. The first author received coupons from Abbott to offset the costs of the product samples for participants' gift bags. Demographic characteristics of the study sample are shown in Table 2. Women comprised more than one half of the sample (n = 8). Mean participant age was 65.5 years, with most participants between ages 55 and 64 years (n = 7) and 65 and 75 years (n = 6). Two participants were older than 75. Approximately 25% of participants were married. All participants had a high school-level education or higher, and two participants completed military service. Among those who self-reported their income (n = 10), most stated that they earned less than $30,000 per year. The major themes identified in the current analysis were: Perceiving Diabetes as a Threat, Constructing Diabetes Knowledge Experientially, and Viewing the Clinician's Role as Limited to Managing Medications and Monitoring Laboratory Values. Despite feeling afraid and overwhelmed when they were diagnosed with diabetes, participants did not describe talking with their health care team about their unsettling feelings around having the condition. Instead, they self-reflected about possible causes for their diabetes and relied on others' experiences to direct their approach to living with diabetes. Engaging in Introspection. Participants made sense of their diabetes by trying to determine its cause. One participant posited, “I think it had to do with stress and where I was living. I wasn't happy where I was at. I was stressing a lot, even though I take some things with a grain of salt” (participant 13). Another participant attributed the onset of his diabetes to not taking care of himself. He was puzzled when diagnosed because he had stopped “abusing” his body: “When I cut back on all that drinking and stuff that's when I started all of this diabetes with my numbers not where they were supposed to be” (participant 10). Another participant hypothesized that his “sugar addiction” led to his body not functioning properly: “My system stopped working and that's why I became diabetic, I guess. I stopped digesting sugar. I still eat sugary things. [I know] it won't be digested, and here my sugar level stays up” (participant 12). Observing and Applying Self-Directed Self-Management Strategies. In addition to identifying the perceived sources of their diabetes, participants' diabetes knowledge was enhanced by observing the behaviors and experiences of family and friends. This knowledge included making day-to-day adjustments to their medications and foods. For instance, one participant, whose brother died from diabetes complications, noted her brother's experience with insulin: “He would have to balance it up or down. He used to take his blood levels—when he felt like it. He was not as compliant as doctors wanted him to be…his blood sugars were way out of whack” (participant 9). In contrast to medically indicated adjustments, three participants adjusted their medications in ways that they perceived worked for them. One participant replaced her prescribed medication with an over-the-counter supplement (participant 2). She lost faith in her prescribed medications after taking them for several years with no perceived improvement in her A1c. Another participant took one half of his oral agent in the morning and the other half if he felt like he needed it later in the day (participant 10). He recognized that the medication might be helpful but did not think that his body needed a full dose. He was confident that his body would show signs if the remainder of the dose was necessary each day. Participant 4 adjusted his oral agent when he perceived that it had a greater effect: “I was only supposed to take one, three times a day. And I'm like, 'Why am I taking this? I'm not feeling no different….I took two…I started feeling a difference… So, I [started taking] two pills, two to three times per day.” Similarly, other participants adjusted their dietary intake when they made “bad” food choices (participant 9) and “fell all the way off the wagon” (participant 8) and would “jump off the ledge and start messing around, like eating a lot of sweets” (participant 1). Adjustments included replacing subsequent meals with salads (participants 1, 7 and 9) and drinking large amounts of water to “flush it out” (participants 1 and 8). A distinction between clinicians' role as treatment providers as opposed to diabetes knowledge providers was pronounced in participants' narratives. The diabetes knowledge that participants described was largely acquired by personal and observed experiences; the knowledge acquired from their physicians and nurses was described as being about medication therapy and laboratory value monitoring. Despite the positive engagement between most participants and their health care providers, participants largely described acquiring knowledge about living with diabetes day-to-day and the physical and mental consequences of uncontrolled diabetes from their personal and observed experiences. They learned about medical interventions from their health care team, but not necessarily how to live day-to-day with the condition. The current study analyses revealed three major themes about participants' diabetes knowledge. First, participants perceived diabetes as a threat. They described what they knew about diabetes and how to manage it within the context of feeling afraid and overwhelmed when they were diagnosed. Second, their knowledge about diabetes was constructed through personal and observed experiences. They reflected on their own behaviors to understand why they developed the condition, and they observed the physical and mental toll that it took on family and friends who had the condition. They learned how to live with the condition based on their own self-directed strategies and the strategies used by individuals close to them. Finally, they considered the diabetes knowledge they obtained from clinicians to be mainly about medications and monitoring their laboratory values. These findings support other studies that address the informal ways in which African American older adults acquire and apply knowledge about diabetes and other chronic health conditions. Researchers have found that African American older adults obtain knowledge “through the grapevine” or via hearsay from fellow church members, family, friends, and neighbors (Ford, Tilley, & McDonald, 1998; Griffith, Ellis, & Ober Allen, 2012; Schoenberg et al., 1998, p. 319; Shaya et al., 2014). Much of this information is derived from lived experiences as opposed to biomedically derived knowledge. Breland, McAndrew, Gross, Leventhal, and Horowitz (2013) found that African American and Latino older patients perceived diabetes based on their feelings and personal experiences and filled gaps in knowledge about diet and nutrition with “self-proven” methods (p. 2898). Similarly, Charmaz (1994) and Sherman and Williams (2018) noted the role that emotions such as fear play and the tensions that individuals experience as they construct new identities as persons with diabetes. Current findings are compatible with the informally directed, self-management behaviors identified by the Common-Sense Model of Self-Regulation (Leventhal, Phillips, & Burns, 2016). This model is grounded in the notion that patients are unlikely to adhere to standard self-management recommendations if they are unrelated to participants' practical understandings. In other work, African American individuals who participated in a 2-year diabetes self-management intervention that focused on experiential learning about diabetes experienced significant improvement in self-management behaviors and glycemic control (Tang, Funnell, & Oh, 2012). Discussion groups during the intervention were driven by participants' questions and concerns about diabetes and diabetes care, as well as their emotional responses to challenges with self-management that they encountered along the way. 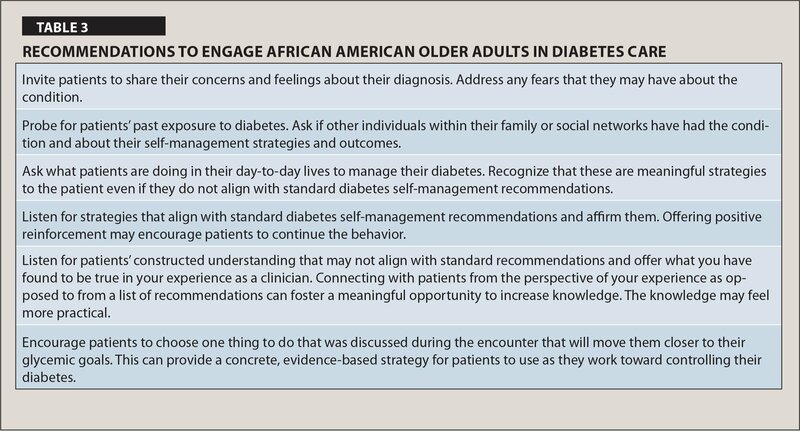 In each of these studies, researchers noted the salience of centering African American older adults' perspectives, experiences, and needs as they related to addressing diabetes knowledge. The current participants noted unique considerations related to living with diabetes as an older adult. These findings support research on the increased vulnerabilities that adults with diabetes experience as they age. The prevalence of geriatric syndromes is high among older adults with diabetes (Araki & Ito, 2009). Geriatric syndromes have been associated with barriers to physical activity (Ferriolli, Pessanha, & Marchesi, 2014) and increased risks for falling, depression, polypharmacy, and poor health-related quality of life (Caspersen, Thomas, Boseman, Beckles, & Albright, 2012), all of which have important implications in diabetes self-management. Informal knowledge is not always congruent with biomedical knowledge. Sometimes informal knowledge includes folk remedies that have served African American individuals well over generations; however, sometimes informal knowledge leads to unsafe self-directed modifications in treatments. A clinician's role is to reconcile formal and informal knowledge in ways that are respectful of personal experience yet consistent with safe practices. Reconciling this knowledge is a thin line to walk, but if knowledge about living with the disease is principally learned outside the biomedical arena, then learning how to integrate the two is essential. The study findings are limited by the small sample. In addition, although participants reported their realities about self-managing their condition and interacting with their health care providers, the ways in which their providers may have assessed and addressed diabetes knowledge during their clinical encounters are unknown. Nonetheless, findings suggest that participants perceived their providers' focus was on biomedical and not experiential knowledge, which limits providers' delivery of patient-centered diabetes education. Findings highlight opportunities for clinicians to assess and address diabetes knowledge that is meaningful to patients' experiences and practical within their lives. Nurses practice in primary care, inpatient, and community settings where they counsel newly diagnosed patients and patients with uncontrolled diabetes. The current findings provide broad implications for the diabetes education that nurses and other health care professionals can impart on African American older adults across these clinical settings. Practical recommendations for nurses and other health care professionals to engage African American older adults with uncontrolled diabetes beyond the biomedical approach to diabetes care are provided in Table 3. The focus of the current article was on the informal knowledge that many African American older adults acquire “through the grapevine” and ways they apply this knowledge to take ownership of their diabetes in ways that are meaningful to them. Participants' informal knowledge guided their self-management behaviors, and those behaviors were frequently inconsistent with standard diabetes recommendations. This finding is important to note because nurses and other health professionals do not typically assess informal knowledge in standard diabetes care, and older adults typically talk about informally acquired knowledge outside of the clinical setting. The findings highlight opportunities to assess what patients understand about the condition experientially and to provide meaningful diabetes self-management education to patients with persistently uncontrolled diabetes. Charmaz, K. (2014). Constructing grounded theory. London, England: Sage. Ford, M.E., Tilley, B.C. & McDonald, P.E. (1998). Social support among African-American adults with diabetes, Part 2: A review. Journal of the National Medical Association, 90, 425–432. Gosse, S. (2014). Women with type 2 diabetes and glycemic control. Medsurg Nursing, 23, 317–320, 329. Mitchem, S. (2007). African American folk healing. New York, NY: NYU Press. Please tell me what your experiences were with diabetes before you were diagnosed. • What d id you know about diabetes? • Whom did you know with the condition? • What do you remember about their experiences with diabetes? Please describe what happened when your physician told you that you had diabetes. • What did the physician say? • What do you remember thinking? • What do you remember feeling? What have nurses, physicians, or other health educators told you about how to manage diabetes? • Please tell me about any diabetes classes you have attended. What, if anything, can be done to avoid complications that lead to things such as losing a foot, going blind, or needing dialysis? What has your personal experience been with diabetes? • What do you do to manage it in your everyday life? • How often do you visit your physician or nurse for your diabetes? • Please tell me about your diabetes appointments. Invite patients to share their concerns and feelings about their diagnosis. Address any fears that they may have about the condition. Probe for patients' past exposure to diabetes. Ask if other individuals within their family or social networks have had the condition and about their self-management strategies and outcomes. Ask what patients are doing in their day-to-day lives to manage their diabetes. Recognize that these are meaningful strategies to the patient even if they do not align with standard diabetes self-management recommendations. Listen for strategies that align with standard diabetes self-management recommendations and affirm them. Offering positive reinforcement may encourage patients to continue the behavior. Listen for patients' constructed understanding that may not align with standard recommendations and offer what you have found to be true in your experience as a clinician. Connecting with patients from the perspective of your experience as opposed to from a list of recommendations can foster a meaningful opportunity to increase knowledge. The knowledge may feel more practical. Encourage patients to choose one thing to do that was discussed during the encounter that will move them closer to their glycemic goals. This can provide a concrete, evidence-based strategy for patients to use as they work toward controlling their diabetes. Dr. Skrine Jeffers is Postdoctoral Fellow, National Clinician Scholars Program, and Dr. Cadogan is Adjunct Professor, Dr. Heilemann is Associate Professor, and Dr. Phillips is Professor Emerita, School of Nursing, University of California, Los Angeles, California. Dr. Phillips is also Senior Director of Research and Education, Arizona Center on Aging, University of Arizona, Tucson, Arizona. Dr. Skrine Jeffers received coupons from Abbott to offset the costs to purchase Glucerna® products for participant incentives. The remaining authors have no conflicts of interest to disclose, financial or otherwise. The authors acknowledge the helpful feedback Dr. Sarah Haley and Dr. Elizabeth Thomas provided during the design and analysis of this study. Address correspondence to Kia Skrine Jeffers, PhD, RN, PHN, Postdoctoral Fellow, National Clinician Scholars Program, University of California, Los Angeles, 10940 Wilshire Boulevard, Suite 710, Los Angeles, CA 90024; e-mail: kiajeffers@ucla.edu.